The leather straps have rough edges (think blisters) which is why I'm returning them. I'm SO spoiled by the glove leather linings of Alegria sandals. I have four pair of favorite Finn Comfort sandals in my closet. These were a tremendous disappointment. Perhaps in a better black nappa, or nubuck, they would be successful. I was shocked at this price point to find the straps stiff, and rough-feeling at the edges where they were "painted" to match. I bought them for the color, but will be satisfied with my better-quality "Sansibar" in marine or black nappa leather. Second pair. Worth the money. I’m a wide 11 and these fit well. The contour of the sole provides excellent support. I wear custom orthodics in my shoes and these provide a nice alternative in the summer. These are elegant & well made athletic leisure shoes. They are winners! 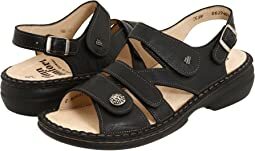 I have re-bought these sandals for high quality, longevity and b/c it has removable foot beds for orthotics. I need structured shoes that don't look like they are orthopedic shoes! I was hesitant about these due to the price, but ordered them anyway. I loved them when I first tried them on; wore them around for a few days trying to find fault with them, but I couldn't. Finally, I gave in and decided to keep them. I wore them to work, stood at my standing desk most of the day (something I rarely can do), and went to a charity event that night. I was in them for 14 hours, on my feet, and no complaints. I love them! I decided the price is worth it. They give me fantastic arch support. They are CUTE. My feet are happy. These sandals are perfect. They are comfortable soft footbed and look like an up to date style not making you feel like your wearing old fashioned shoes. I will be getting more of these. Fit and size are perfect for my Finn Gomera sandals. I have 3 pair of Gomera sandals and replace the insoles every one to 2 years. Like many other wearers of Finn shoes I have foot issues, specifically the heel/ankle of my right foot. For years I have relied mostly on Vionic and Birkenstock shoes and insoles. Lately I have felt I needed more support around my heel and ankle area. After reading about Finn Comfort shoes thought I would try them. There is no doubt the Ikebukuro shoe is comfortable, supportive and has a roomy toes box. However after 15 minutes of wearing them I knew they were not right for me. The shoe itself comes high up on the foot and the tongue protrudes slightly, which I found uncomfortable after a few minutes of walking. And boy do they squeak on hard floors. I could have sucked up the price with those minor flaws if they weren't so orthopedic-looking. I have fairly thin legs and I looked like a cartoon character wearing them. I could not convince myself I would get my money's worth out of them at this time. Who knows, I may come back to them at a future date and be very thankful for the support and comfort I am certain exists. I did think to buy Finn insoles to try as a better option but unfortunately Zappos did not have my size. I love Zappos customer service for making shopping online so worry free and easy. I really appreciate that Finn brand combines contemporary styling with great comfort. I was hopeful, but these didn't work for me. I have bad toes, one had surgery for a bunion and the other foot has a bunion and other toes not good either. My custom inserts don't fully fit into the shoes. They noticeably stick out over the top and are not pretty looking. So, then I tried to wear them with the inserts the shoes come with and after a day of wearing them around the house my toes were in pain. They just don't have enough support for me. For the price, I am returning them and continuing my search. I really want sandals that accommodate medically necessary custom inserts. Maybe one day! I liked the shoe very much. Good heel height, beautiful. But my neuroma didn’t. So back they go! 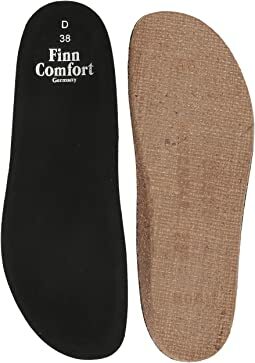 The insole is a nice Finn Comfort insole. The shoe was a bit wide for me and I had it adjusted to the maximum. I really wanted to like these shoes. The pattern was really cute but the shoes had the oddest position for an arch support. It was positioned in such a way as to really hurt my feet. I had to return the shoes. They were true to size and width, but oddly the arch support was awful. I am wearing them right now. 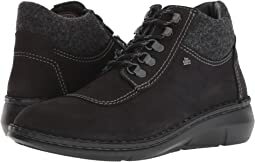 I wear Finn Comfort shoes most all the time and these are a nice addition. This is my 2nd pair of these shoes and I absolutely love them. They are extremely comfortable and since they are made in Germany, the quality is superb. They are a bit on the pricey side but worth every penny. I highly recommend this brand especially if you suffer with plantar fasciitis. I really wanted to love these shoes, even willing to pay the high price. I am very disappointed that they did not work for me. Basically the issue is that there is not enough padding on the forefoot - i have problem feet and need cushioning. Also found that they dug into the side of my ankle. I tried to use my own orthotics but they did not fit properly in the shoe. So sad that i had to send them back. I really wanted to love these shoes, even willing to pay the high price. I am very disappointed that they did not work for me. Basically the issue is that there is not enough padding on the forefoot - i have problem feet and need cushioning. But the shoes are beautiful, rich coloring and relatively soft leather. So sad that i had to send them back. I bought the Finn Comfort Gomera to wear on my trip to Israel. So far I have only walked around the house in them, but they are super comfortable, no pinchy spots, will work for all day walking and the arch support is great. I really like the way to insole is removable if I ever have the need to replace it, but I don't have a need to. 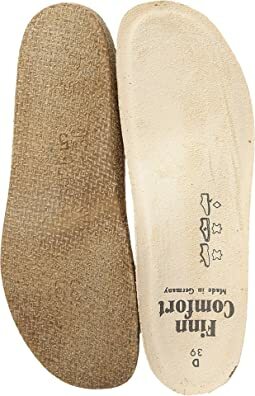 This insole if very comfortable on my foot. Pretty shoe white with like light blue/grays swirls. Foot bed to hard for these sensitive feet and I did not like how heel sits up higher and puts stress on ball of my feet. I like Finn shoes, but the higher heel and the narrow base on the sole causes me to repeatedly turn my ankles. Lovely shoe, but the base of the sole is way too narrow and therefore, unstable for me! Love these shoes. I have had another style of Finn Comfort shoes. I have a broken foot now and these stylish shoes are a wonderful help for my recovery!